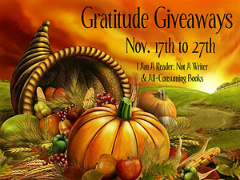 Welcome to the Gratitude Giveaways Hop hosted by I Am A Reader, Not a Writer and All-Consuming Books! This hop runs until November 27th which will give you plenty of time to enter all the giveaways. There are 300 blogs each saying thanks to their followers by offering a simple, easy, one entry giveaway. No long list of optional entries on this hop – they are not allowed. The list of blogs is under my entry form.